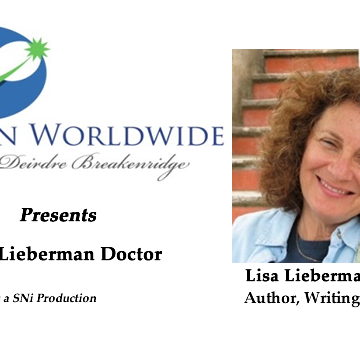 The host of Women Worldwide, Deirdre Breakenridge, welcomes her guest to the show, Lisa Lieberman Doctor. Lisa currently leads writing workshops in Los Angeles and also teaches at the UCLA Extension Writers' Program. She is the author of the new book Accidental Poetry: Improve Your English Through Creative Writing, a book that helps people to learn the English language in an organic and effective way. On the show, Lisa discusses her early career experiences as a major motion picture executive working with well-known personalities such as Robin Williams and Sylvester Stallone. She also share her incredible passion for writing and how she reinvented her career transitioning into a staff writer position on ABC's "General Hospital" and its spin-off, "Port Charles." A little more about Lisa Lieberman Doctor...Lisa was born and raised in Queens, New York. After several years writing daytime drama, she refined her focus to writing fiction and coaching other writers. Her first novel, The Delowering of Rhona Lipshitz, was published by Elderberry Press in 2003. You can find out more about Lisa on her website and connect with her on LinkedIn. A little more about Your Host, Deirdre Breakenridge … Deirdre is an author, entrepreneur and CEO of Pure Performance Communications. A 25-year veteran in PR and marketing, she is the author of five Financial Times Press books including her latest titles, “Social Media and Public Relations,” and “Putting the Public Back in Public Relations.” Breakenridge speaks nationally and internationally on the topics of PR, social media and marketing. She's an adjunct professor at NYU and UMASS at Amherst, a recognized blogger at PR Expanded, and also the co-founder of #PRStudChat, a dynamic twitter chat with PR professionals, educators and students. Connect with Deirdre by following @dbreakenridge on Twitter and on her blog at www.deirdrebreakenridge.com.